There's plenty of cool things coming up from All WNY Radio. We moved our music servers to a new streaming format on Friday and we'll be announcing the 2015 All WNY Music Award winners soon, as well as introducing a new talk show and more. And we're moving into our new office at ART247 in Lockport next week. Today, we introduce a free (beta version) Android app available for download immediately. The app must be currently be "sideloaded" onto Android devices but once we are sure the app functions as we think it does (that's what makes it beta), we'll put it into the Google Play Store. The functionality of the app is pretty simple. 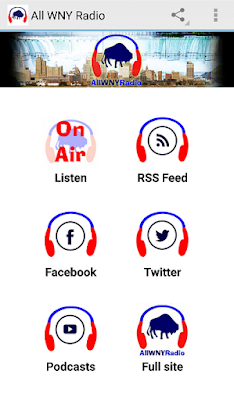 Listen to the live stream (and keep listening even after you move on to other tasks), check recent posts from AllWNYRadio.com, link to our Facebook and Twitter, download podcasts and visit the whole site. It also has notifications so we can send a message straight to your phone when we have a live show. Please feel free to download the app and use it. But we ask that you send us an email to let us know what you think of it. Especially if everything doesn't work properly. And let us know what mobile device you're using so we can add it to the verified list of devices. Of course, we're always looking for new music. If you're from Western New York (that's Jamestown to Rochester and everything in between), submit your tunes via our contact page. We're also renewing our effort to raise funds for our operations. If everyone who has visited AllWNYRadio.com in the past month donated $1, it would pay our costs for the year. Consider throwing a dollar our way (even change adds up) via PayPal or make a recurring donation on Patreon. For those of you who want something MORE for your money, consider display or audio advertising on All WNY Radio. Contact us for details. We'll have more announcements in the near future. Keep your eyes here and your ears on the music.